If you’ve been looking for healthier lunch options, this vegetarian chickpea salad recipe is a wonderful and nutritious choice. 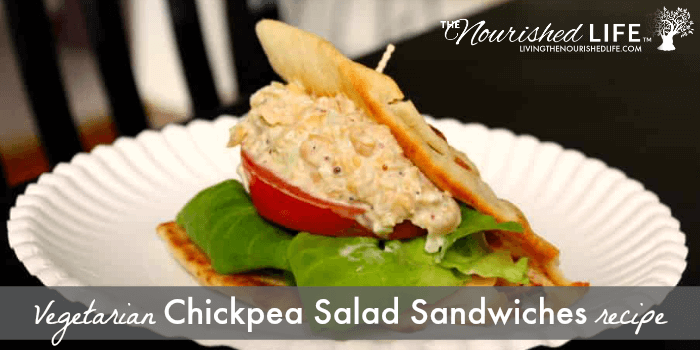 This vegetarian chickpea sandwich recipe is a healthy and delicious lunch option. Not only is this chickpea salad quick and easy to make, it also provides necessary nutritional benefits. A vegetarian source of protein, chickpeas are a nutty tasty legume that’s best known as a key ingredient in hummus. Rich in fiber, carbohydrates and protein, chickpeas are a lot healthier than you might imagine. Chickpeas contain key minerals like iron phosphate, calcium, magnesium, zinc and vitamin K that support bone health. Additionally, regular consumption of chickpeas can help control blood sugar levels, and improve digestion. Since they can also help balance cholesterol levels and maintain healthy blood pressure, chickpeas are also able to protect your body from heart disease and cancer. For those who are trying to maintain a healthy weight, chickpeas assist with that, too. The high fiber and protein content of chickpeas helps to not only curb food cravings, but you’ll feel full longer. This in turn aids your body in controlling blood sugar levels and maintaining your energy level. While hummus is a delicious and nutritious way to enjoy the benefits of chickpeas, you don’t have to eat hummus 24/7. There are many other wonderful and healthy recipes that contain chickpeas. One of my favorite ways to enjoy chickpeas is to include them in chili to add additional texture. However, you can also enjoy them the same way you would chicken or tuna salad sandwiches. 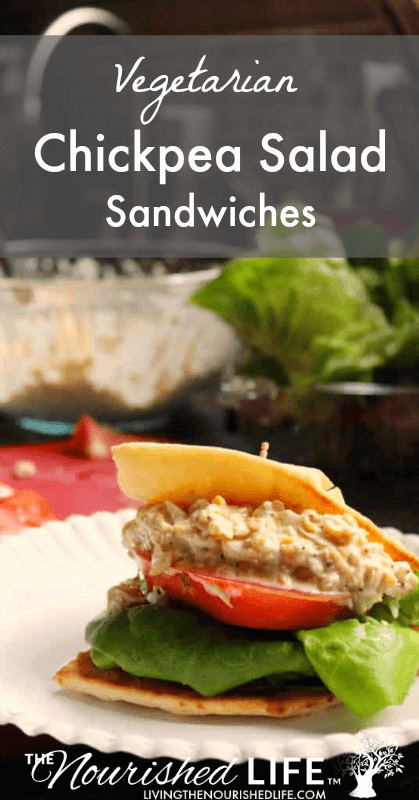 You can eat your chickpea salad on your bread of choice. Whether it’s a pita bread, wheat bread or naan. Alternately, you could also skip the bread entirely and eat this vegetarian chickpea salad recipe inside lettuce cups. 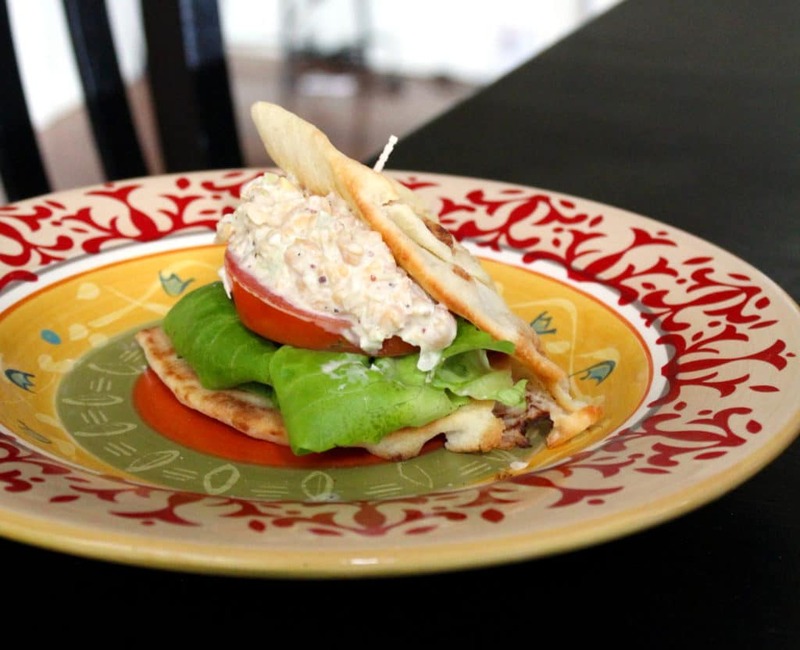 I chose plain naan for my chickpea salad sandwich recipe for the flavor. Naan is often considered to be high in fat. However this is because it’s often brushed with coconut oil or ghee. Plain naan or plain whole wheat naan are healthier options than sweet or savory filled naan bread. They both contain lower fat and fewer calories. Additionally, both varieties of regular naan are rich in vitamins. Plain naan contains over 10% of the the recommended daily value of iron and the vitamins niacin, thiamine, riboflavin and vitamin B-6. While whole wheat naan boasts more than 10% of the recommended daily value of magnesium, phosphorus, thiamine, niacin and vitamin B-6. No matter what type of bread you use or don’t use, this chickpea salad recipe is incredibly tasty and easy to make, so you can have a healthy lunch, no matter if you eat it on salad or bread….or just by the spoonful. Quick and easy to make, this chickpea salad recipe is incredibly versatile: put it on salads or the bread of your choice for a tasty, healthy, and filling lunch. Combine the chickpeas in your food processor and pulse several times to roughly chop. Add the mayonnaise, mustard, vinegar, celery and onion to the food processor with the chickpeas. Pulse just enough to blend then add salt and pepper to taste. Meanwhile, heat the naan bread in the oven until warm, then cut each piece of bread in half. 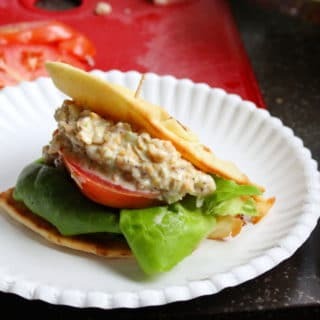 Assemble your chickpea salad sandwich, laying the chickpea salad along with a slice of tomato and desired amount of lettuce onto the naan. Serve immediately, refrigerating any leftovers. Is this 818 calories per serving or total? How many servings does this make? This made multiple servings for me. Three of us tried this for lunch and there were still leftovers.